How did you start riding – and wind up at N24HC? Well, I learned to ride a bike at age six – does that count? – but I didn’t get serious until college, when I would borrow my roommate’s bike and explore Providence, Rhode Island, and surrounds on weekend mornings when everyone else was hung over and asleep. I bought my own first road bike at age 20 to tour in Nova Scotia. I bike-toured for a few years, but when I took my first job, teaching in a private high school, I was recruited to coach the bike-racing team, not because of any knowledge of bike racing but simply, I suspect, because I owned a bike. After my first season, my assistant coach asked me to crew for him at N24HC. 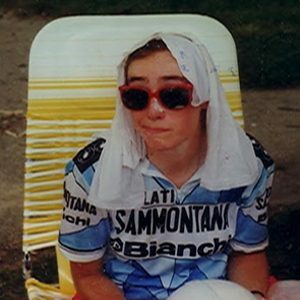 This was the first I’d ever heard of a 24-hour bike race, but while crewing that first year, I was inspired by the riders and attracted to the idea of being waited on hand and foot, riding in the dark, and eating junk food at all hours. So the next year, I did my first ride. So was your first ride like being at a spa, waited on hand-and-foot? I can hardly remember, but I think the reality was pretty much what I expected – except for the spa part. My crew did wait on me hand-and-foot: I had all the grapes, Pop-Tarts, and cheese sandwiches a girl could ask for, and my bike was always waiting for me when I came out of the port-a-John! Perhaps the only surprise was how slowly I was moving the bike in the last few hours (9 mph on dead flat roads?) despite giving it everything I had. But by staying on the bike, even when I was going slower than anyone else out there, I rode over 300 miles! In the spring prior to the event, two or three shorter rides per week (around 25 miles each) and a long ride – up to a century – over the weekend (usually with some kind of fun cross-training, like volleyball or a hike the other weekend day). Practice eating while riding. Ride long distances alone.